Puppy is healthy and will have been wormed and received first set of vaccines with purchase. 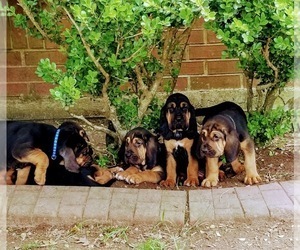 Overview: The Bloodhound is large and remarkably strong, so he requires great discipline. On the other hand, he is eager to please, and can be a kind and loyal pet when given the opportunity. Colors: Black and tan, liver and tan, and red. Coat: Dense and short. The skin is thin and loose, falling in wrinkles around the head and throat. Its long ears stir up scent and its profuse wrinkles trap theodors around the face. 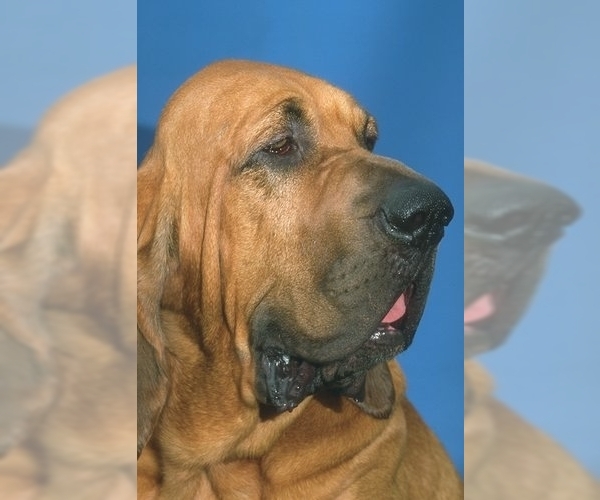 Character: Bloodhounds are independent, gentle, and affectionate. They bark loudly, but rarely. This breed is well-known for its keen sense of smell. Temperament: This breed gets along well with most children, as long as they are gentle and respectful. They will greet visitors and live well with other dogs and household pets. Care: The Bloodhound requires occasional grooming and periodic ear cleaning. The Bloodhound drools a lot, so its facial wrinkles require daily cleaning. The ear tips drag in food and must also be kept clean. Training: This breed needs consistent training, as they're not known for being very obedient. Patience and persistence are required. Activity: A Bloodhound has great endurance, so enjoys long walks on a regular basis. Health Issue: This breed is prone to bloat, hip dysplasia, and ear infections. They may also have entropion, where the eyelids turn inward. AKC Reg. 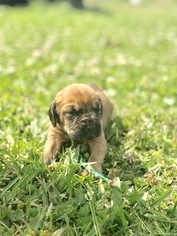 Bloodhound puppies 2 Red Females 1 Red Male. 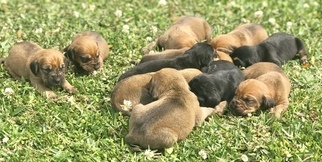 4 Black & Tan Females 3 Black & Tan Males. They will be microchipped. Up to date on all vetting. 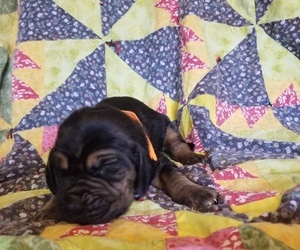 I have 3 Male and 5 Female Black/Tan (saddleback) Bloodhounds They will be available for pick up April 15th. Parents on site. 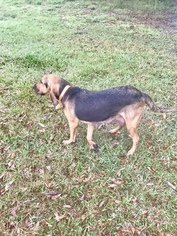 Posted Breed: Bloodhound (short coat). Adoption Fee: 200. 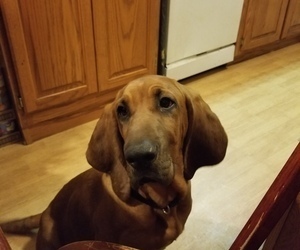 Posted Breed: Bloodhound (short coat). Adoption Fee: $420.00. 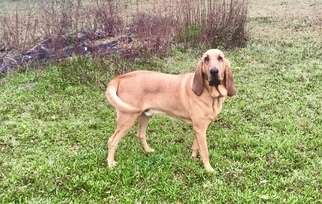 Posted Breed: Bloodhound (short coat).